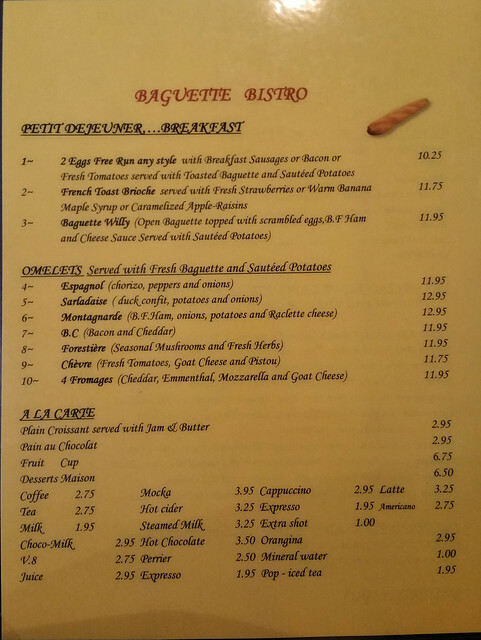 My budget-conscious friend decided to try Chez Mémé Baguette Bistro despite usually ending up at Red Robin for one of their two-for-one burger specials. 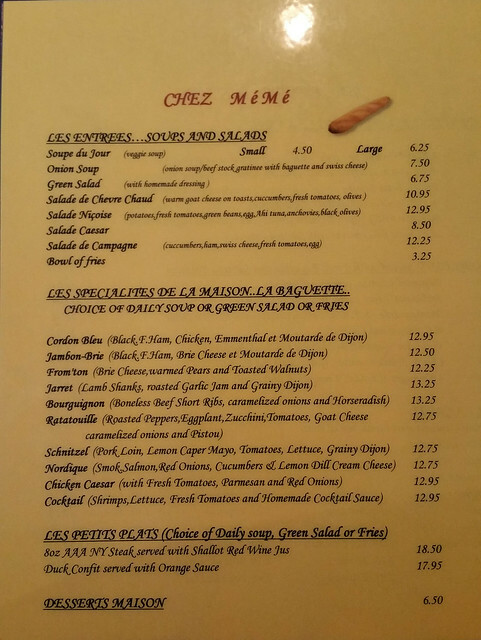 Chez Mémé has an extraordinary near-perfect score on Zomato, which usually scores tougher than Yelp. Overall items were not very salty, so if you're used to that you might even think they are not salty enough. 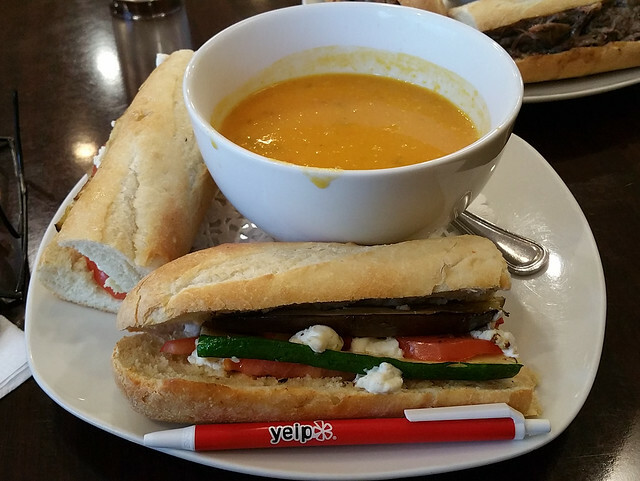 Baguettes / come with your choice of fries, salad, or daily soup. Daily soup can come warm or piping hot and no matter the weather I suggest you get it hot because as you work through your meal it's going to get cold. If you've read some reviews from several years ago, be aware that the prices have gone up. 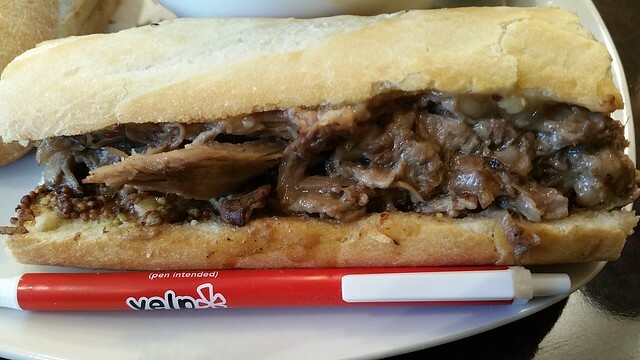 Their lamb sandwich used to be $10 around 2010, but is now $13.25. (Menu at the bottom of this post). As previously mentioned, this might come across a bit bland if you're expecting what looks like meat from a stew to be on the salty savory side. Very gamey! Make sure you like your lamb that way. Big chunks of meat. Watch out for small pieces of bone -- My friend was maybe unlucky because she got three pieces about the size of a 25-cent coin each. Overall I personally would have liked it a bit saltier. Considering price for portion, it's hard to go wrong here at $13.25. You get what basically amounts to two burger's worth and the filling is basically meat meat meat. 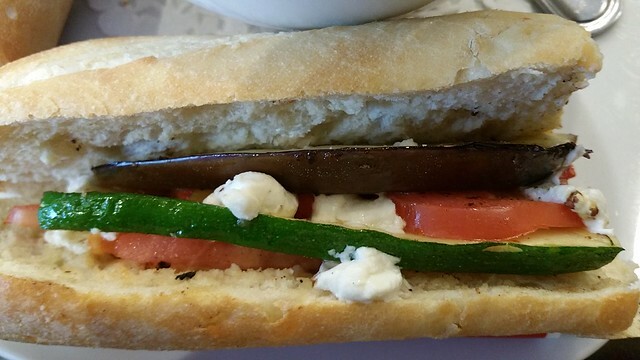 Plus baguettes are slightly heavier and more filling than the typical soft, light buns used in burgers nowadays. 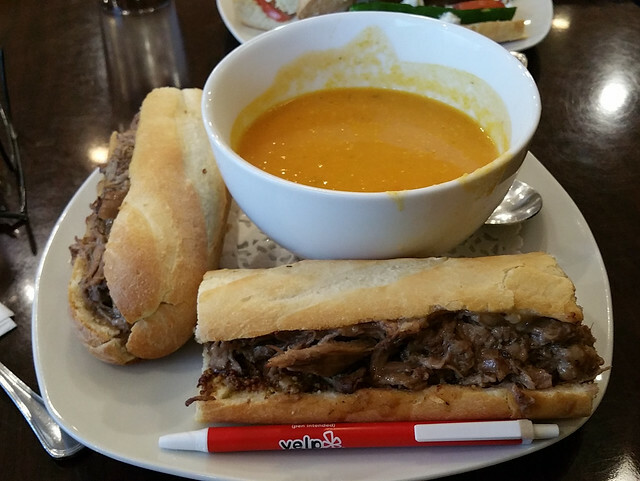 In the pictures below, remember that you get TWO sandwiches per plate plus soup if you chose that option. Pretty bland, plus strangely there wasn't a lot of contribution from the goat cheese, which is typically quite strong and might have rescued this sandwich. Somehow needs more flavour contribution from the veggies. Maybe if they used an actual vegetable stew ratatouille it might have worked better. Possibly because of the skin being still on the veggies, there was a tendency for a bite to end up pulling out one of the vegetable strips. I'd give this a pass and get something meaty or something else if you're going vegetarian. We came for lunch shortly after Noon and the breakfast menu was still available. The small place was almost at capacity but quiets down suddenly after the Noon-ish lunch rush. If you're going to go, pay special attention to their hours! -- They close at 3pm and are not open weekends! Service was very good! Calm, friendly, attentive, and not pushy at all. Hmm... The restaurant must not know the chicken one is especially good because they recommended the beef and lamb sandwiches instead. I'll have to keep that in mind Thanks for the tip!